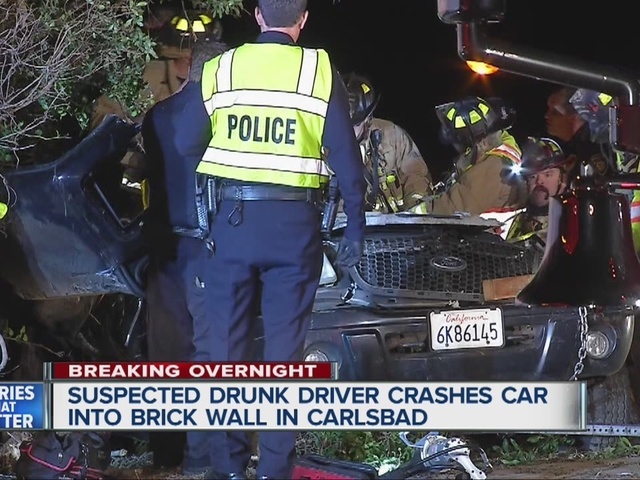 CARLSBAD - A suspected drunken or drugged driver was severely injured when his pickup truck flipped several times and slammed into a brick wall in coastal Carlsbad Sunday night. A 23-year-old San Marcos man apparently lost control of his 2001 Ford Ranger and allowed it to veer off southbound Carlsbad Boulevard near Cannon Road around 9:45 p.m., according to a Carlsbad police statement. The truck rolled several times and struck a brick wall, trapping the driver inside. Carlsbad Fire Department personnel freed the driver from the wreckage of his pickup. The crash occurred near a wide open section of beach, allowing for a rescue helicopter to land nearby. The driver was airlifted to Scripps Memorial Hospital La Jolla with serious head and upper body injuries, police said. The southbound lanes of Carlsbad Boulevard were temporarily closed during the rescue.